There are three considerations in deciding if a workflow should be automated through SharePoint: Complexity, Volume, and Importance. 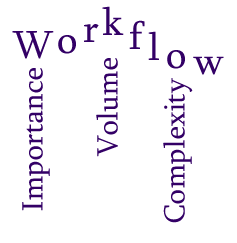 A workflow should only be automated if the steps are complex enough to warrant the effort. That’s not to say, SharePoint can’t be used for simple workflows, but just that the out of the box low level functionality is probably sufficient. For example, if a company wants to automate the dispersal of project updates, then there are simple ways in SharePoint to handle that without creating some custom workflow. Create a discussion board and subscribe interested users. Create a mail enabled document library and subscribe all of the interested users to changes. Then you can email to the document library your project updates, and those updates will be promulgated out to the interested parties. Workflows with enough complexity, and thereby enough opportunity for human error should be automated, so long as they are important enough, and are repeated frequently. Bothering to create a workflow in SharePoint or any other system is only worthwhile if the workflow is repeated frequently enough, with few enough variations that the work of developing the workflow is less then the work to do something else. Important, complex workflows that are seldom repeated shouldn’t be automated. Some workflows are simply too low profile to be worthy of the effort. There aren’t any significant consequences to screwing up an office supply order. Planning office birthday parties doesn’t justify a workflow. If the mundane is repeated often enough, however, a workflow may make perfect sense. Monthly expense reports are simply not that critical to the business, but if hundreds of reports are submitted each year, creating a system to monitor them makes some sense.